I love all things honey. One of my favorite things about the Jewish holidays is that it's totally acceptable to eat buckets of honey (dipping apples in honey signifies that you wish people a sweet new year). And one of my favorite books, The Secret Life of Bees, centers around the sweet stuff. 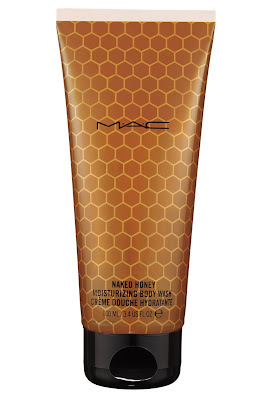 So is it any wonder that I'm totally dying over the new M.A.C Naked Honey Body Wash? I was enamored from the very beginning ... because while the tube may seem ordinary at first glance, it so isn't. Look closer and you'll notice that it's designed to look like a honeycomb -- and, of course, it's the color of deep amber honey. But it's what's inside the tube that really gets me going ... because this body wash is actually formulated from real bio-converted honey! And the scent, ohhhh, the scent. Extracts of lavender, narcissus, jasmine flower waxes and blue agave not only help to cleanse, moisturize and nourish the skin. No, they actually make this body wash smell unbelievably amazing. It's sweet but not cloying, lush but not too rich. Every time I lather up, it somehow overpowers and envelops me without seeming too heavy. Now that's something worth smiling about. Formulated from bio-converted honey, this body wash cleanses the skin while providing the soothing and moisturizing benefits of lavender, narcissus, jasmine flower waxes and blue agave extracts. Provides a sensual, calming, cleansing experience. Limited edition. M.A.C Naked Honey Body Wash is limited-edition and retails for $19.50. For more information on the Naked Honey collection, click here.